Wishing you an artful 2018 and I hope to connect with you soon at an upcoming event. The Art Los Angeles Contemporary is next week at the Barker Hanger. 1/25-1/28/18. Part of Getty PST LA/LA is the exhibition Judithe Hernández and Patssi Valdez: One Path Two Journeys at The Millard Sheets Art Center in Pomona. Continues thru 1/28/18. Opening 2/1/18 at Fullerton College is a group show, Visual Resistance featuring work by Dwora Fried, April Bey and others. 2/1-2/21/18. Ellen Gallagher Accidental Records continues at Hauser and Wirth. In this series of paintings and drawings, the exhibition finds Gallagher returning to and building upon themes and motifs at the center of her practice. These works extend her exploration of the complex histories of the Black Atlantic and the afterlives of the Middle Passage. Widely acclaimed for her own genre of history painting, Gallagher questions accepted geographies. Continues thru 1/28/18. Lisa Seebach’s Soft Architecture is the current exhibition at http://www.meliksetianbriggs.com/ (image left). 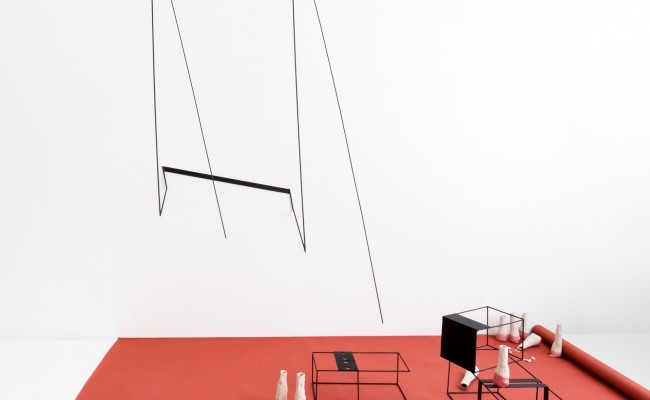 This Berlin-based artist has made a site-specific installation consisting of five individual sculptures, three wall-works and two floor pieces, comprised of steel and ceramic components. Seebach’s sculptures are made in relation to the human form and its dynamics – how the body interacts with the sculptural form. Each sculpture conjures an amplified moment – elegant and fragile – evoking a space containing something of a thought. “The title of the exhibition, Soft Architecture, relates to the artist’s conception of a ‘psychological structur’ governing the installation – her memories of architectural settings and architectonic forms in the built environment of the city and living spaces combined with heightened psychic tension and mental consciousness, emotions and sensations.” Continues thru 2/24/18. Regen Projects presents Catherine Opie’s first film, The Modernist (image right). The following is from the gallery’s press release: “This film presents a dystopic view of Los Angeles, a city that has figured prominently in Opie’s work over the years. The film is in conversation with Chris Marker’s radical 1962 photo-roman, La Jetée, which utilizes still photography to tell a story of longing, time travel and the terror of nuclear apocalypse. Opie’s film continues this dialogue, employing similar formal and narrative structures to a different end. Focusing on contemporary issues like natural disasters, the breakdown of the American political system, global tragedies and the Los Angeles housing crisis. The film stars Stosh, a.k.a. Pig Pen, a close friend of Opie’s who has appeared in many of her photographs, as a struggling artist who is obsessed with landmark mid-century modern architecture.” The film is 22 minutes in length and is composed of over 800 black and white still images. Runs 1/12/18 thru 2/18/18. Opening reception on Friday, 1/12/18 from 6 to 8 pm. Anat Ebgi Gallery is pleased to announce Sunset, the first solo exhibition of Caroline Walker in Los Angeles . The exhibition focuses on the figure of a woman within the psychological spaces of a modernist Hollywood Hills home. Large scale paintings as well as works on paper are featured. Continues thru 3/3/18. 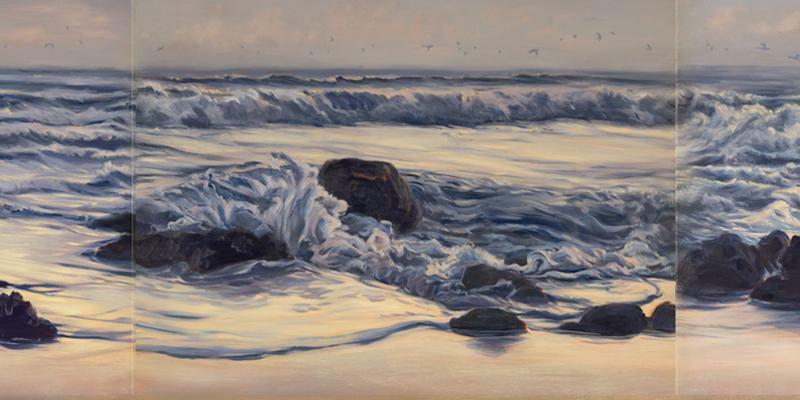 Four Million Angels is the upcoming exhibition at the Annenberg Community Beach House Gallery. The exhibit examines the people who fill the streets of Santa Monica on a sunny day. Whether they are visiting the Santa Monica Pier, the 3rd Street Promenade, Angels’ Attic, Bergamot Station, a concert at McCabe’s Guitar Shop or Santa Monica State Beach, a diverse cross section of Angelenos will be in the crowd. Given the dramatic presence of the ocean, the four million people that live in the City of Los Angeles find Santa Monica to be one of our greatest magnets. The artists include Mark Steven Greenfield, J. Michael Walker, Kathi Flood, Michael Massenburg, and Katherine Kean. Katherine Kean and Kathi Flood. All of the work in this exhibit reflects a passionate interest in the people of Los Angeles and speaks of our universal experiences. 1/18-4/30/18. Opening reception: 1/25/18, 6 pm: RSVP Panel Discussion: 2/17; 3-5 pm. 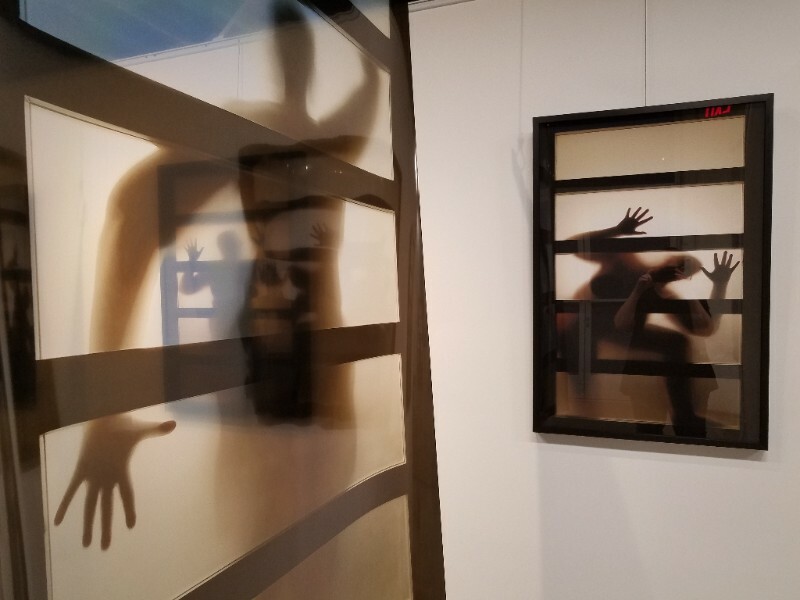 ARK Gallery in Pasadena presents Plus, an exhibition of photographic work by Kristine Schomaker (see image right below) that continue her explorations of body image. Here she engages in a dialogue with other female/feminist artists who have become empowered by exposing their vulnerabilities in front of the camera – Laura Aguilar, Hanna Wilke, Eleanor Antin, Jenny Saville, Anna Mendieta. She succeeds in overcoming inhibitions by celebrating her physical form. 1/21-3/18/18. Opening Reception: 1/21, 4-7pm ; Artist Talk: 2/11/18, 3-5pm; Closing Reception: 3/18/18, 2-5pm. Alexis Smith: Private Lives and Public Affairs is the exhibit at the Weisman Museum at Pepperdine University in Malibu. Smith is a mixed-media artist well-known for her witty commentary on popular culture. She begins with an array of images—ranging from thrift-store finds to nostalgic advertisements—and juxtaposes them with poetic and poignant texts. Her art underscores how the media shapes our self-image and reminds us that meaning is often fugitive and always surprising. “I collect everywhere I go, and I like to work with everyday life forms as opposed to high-art forms,” Smith says. “Also, there is often an emotional poignancy to my work. It’s uncynical. It’s very of-the-world.” 1/20-4/18/18. 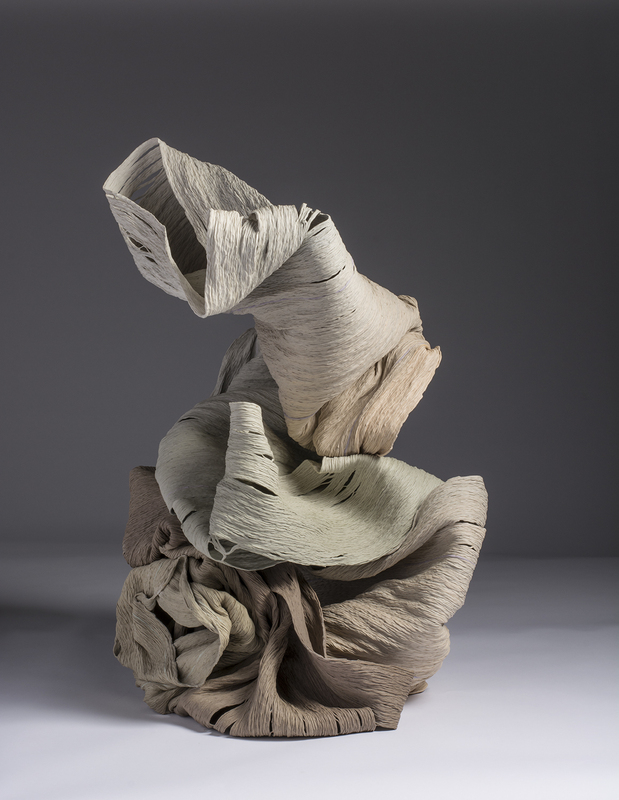 The Craft & Folk Art Museum presents Melting Point: Movements in Contemporary Clay, a group exhibition of 22 artists whose experimental manipulation of clay expands the technical, aesthetic, and metaphoric potential of the ceramic object. The exhibit is organized around 3 themes: the anti-disciplinary process, object temporality, and sociopolitical interpretations. the exhibition presents sculpture, site-specific installation, time-based work, and performance. Among the artists whose work is represented are Susannah Biondo-Gemmell, Patsy Cox, Julia Haft-Candell, Jennifer Ling Datchuk, Linda Lopez, Jami Porter Lara et al. 1/28-5/6/18. Opening: 1/27/18; 6-9 p.m. Free for CAFAM members, $12.00 for non-members. Check their website for accompanying programs. Laura Aguilar: Show and Tell is the first comprehensive retrospective of her work (image left). The exhibition is part of Getty PST LA/LA at the Vincent Price Museum. It will feature over 100 works produced during the past three decades. Aguilar’s highly personal and political imagery intersect performative, feminist and queer art genres. Thru 2/10/18. Also at the Vincent Price Museum is Dis..Miss. The exhibition (image below) involves 20 artists and art collectives’ short original commissioned videos and offers postcards in trade for viewers’ answers to provocative questions related to gender. The artists’ works consider dialogues between feminism and gender fluidity, asking such questions as: “Who decided your gender?” “How can feminism support equality?” and “What is the problem? My body? Or society’s perception of my body?” Visual artists include April Bey, boychild, Cassils, Chan and Mann, Roya Falahi, Alexandra Grant, Micol Hebron, Thinh Nguyen and Shizu Saldamand. Video artists include Adebukola Bodunrin, Mail Order Brides (Eliza Barrios, Reanne Estrada, and Jenifer Wofford), Gloria Morán, Meena Nanji and Caress Reeves. “Dis..Miss” is organized by Freewaves, the media arts organization promoting engagement on current issues through art. To view Dis…Miss videos, postcards and events visit freewaves.org. Thru 2/10/18. The Pasadena Museum of California Art‘s upcoming exhibition is The Feminine Sublime. The exhibition will feature paintings that provide a feminist perspective about the concept of the sublime. Exhibition artists and Los Angeles-based painters Merion Estes, Yvette Gellis, Virginia Katz, Constance Mallinson and Marie Thibeault counter traditional landscape painters and enlist challenging aesthetics, formal inventiveness and provocative imagery to re-imagine relationships with rapidly changing urban and natural environments in more relevant and meaningful ways. Runs 1/21/18 thru 6/3/18. Ana Serrano: Homegrown will also be presented this month at PCMA. Serrano’s immersive “garden” both references a recognizable urban landscape and pays homage to the artist’s family connection to the land in Mexico. Highlighting the juxtaposition of the built environment and plant life, the installation is composed of bright-colored walls and lively plants made of cardboard and paper. Runs 1/21-18 thru 6/3/18. The two outstanding exhibitions at the California African American Museum are We Wanted a Revolution: Black Radical Women, 1965-85 and Lezley Saar: Salon de ReRefusés. We Wanted a Revolution: Black Radical Women, 1965-85 (image right) focus on the work of African American women artists by examining the political, social, cultural and aesthetic priorities of women of color during the emergence of second-wave feminism. The artists represented in the exhibition include Emma Amos, Camille Billops, Kay Brown, Vivian E. Browne, Linda Goode Bryant, Beverly Buchanan, Carole Byard, Elizabeth Catlett, Barbara Chase-Riboud, Ayoka Chenzira, Christine Choy, Blondell Cummings, Julie Dash, Pat Davis, Jeff Donaldson, Maren Hassinger, Janet Henry, Virginia Jaramillo, Jae Jarrell, Wadsworth Jarrell, Lisa Jones, Loïs Mailou Jones, Barbara Jones-Hogu, Carolyn Lawrence, Samella Lewis, Dindga McCannon, Barbara McCullough, Ana Mendieta, Senga Nengudi, Lorraine O’Grady, Howardena Pindell, Faith Ringgold, Susan Robeson, Alva Rogers, Alison Saar, Betye Saar, Coreen Simpson, Lorna Simpson, Ming Smith and Carrie Mae Weems. Salon de Refusés is an exhibition providing some highlights from the career of Lezley Saar. The exhibition is wonderful, personal, whimsical and brilliant!!! Continues thru 2/28/18. Unspeakable: Atlas, Kruger, Walker at the UCLA Hammer Museum is a selection of video installations from the Hammer Contemporary Collection organized by Connie Butler, chief curator, and Ann Philbin, director. The exhibition features major works by American artists Charles Atlas, Barbara Kruger and Kara Walker (image left) created in the last decade. Among these is Kruger’s The Globe Shrinks, a four-channel, 13-minute compilation of video and text that narrates, in a series of scenes and skits, the conflicting coexistence of kindness and brutality. I was transported in a five-channel installation by Walker that touches on the Civil War, the slave Sally Hemings, the artist’s studio and the genocide in Darfur. In this work, Walker’s signature silhouettes playing out haunting emotional vignettes are flat hand puppets set against vividly colored backgrounds, accompanied by a soundtrack of country music. Runs from 1/20/16 thru 5/13/18. I continue to recommend The Getty PST LA/LA exhibition titled Another Promised Land: Anita Brenner’s Mexico continuing at the Skirball Cultural Center. It offers a new perspective on the art and visual culture of Mexico and its relationship to the United States as seen through the life and work of the Mexican-born, Jewish-American writer Anita Brenner (1905-1974). Runs thru 2/25/18.